It’s in the middle of Paris Fashion Week and this is my first time in Paris (hypothetically speaking). I’m sitting on a bench by the Seine, in between shows, when a chic Parisienne approaches me and asks me a question in French. Instead of going “huh?” I reach into my handbag and pull out my handy little phrase book- Parisienne French. I flip through the pages, find what I think she was asking and answered her back, while also casually mentioning that I don’t speak French that well. Seeing as that had broken the ice, I kept the book a little closer throughout my Parisienne adventure. Parisienne French is full of cultured words and phases that include slang and plenty of stylish sayings, as well as a neighborhood guide, that helped me get through fashion week. 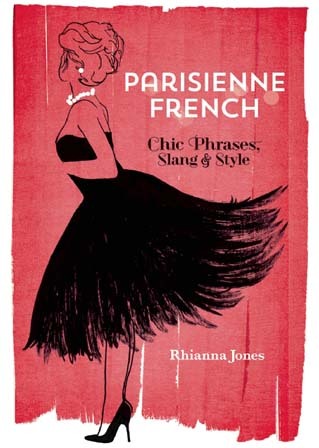 Rhianna does a fine job in turning a “normal foreign phrasebook” into the ultimate destination and “Je Ne Sais Quoi” guide for the fashionable set (and first-timers). She poured her heart and soul into creating the guide, crediting her past experiences in Paris- sitting at cafes most of the day, people watching and exploring the quaint arrondissements. The comprehensive book is small enough to fit into your purse or clutch. So the next time you find yourself at a French bistro with a significant other and are looking to impress him/her with your new-found vocabulary, let Parisienne French come to the rescue! I did indeed pour my heart and soul into this book and so appreciate hearing that its evident. C’est magnifique to hear you enjoyed it!